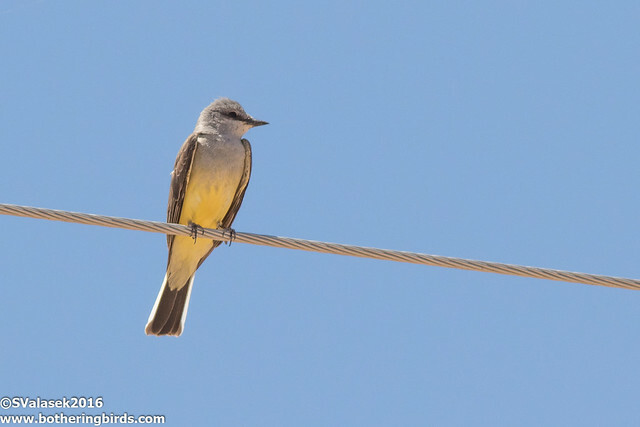 On May 30th Dave Stejskal made a post on the Arizona/New Mexico listserv describing a bird that he noticed while camping with his family in a remote part of teh Santa Rita Mountains, south of Tucson. After taking some fellow experts out to the location they all agreed that Dave had found the first record of a Pine Flycatcher in the United States. There was quite a discussion about the bird in birding circles and people really wanted to see it, but it's location was at the end of a very rough and difficult road. Lucky for me, a local birder was offering people rides out to see it, for a fee. I took advantage of my parents visiting and scheduled a spot for an early-morning ride out to Aliso Springs. I met Garrey the driver and a birder who traveled out from California and another from nearby Sierra Vista to see the bird. The road was really terrible and I am really glad that I didn't try taking any of my cars out there. 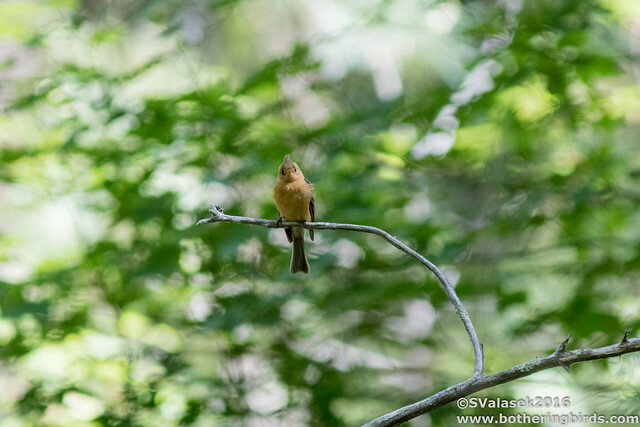 But after 45 minutes we finally made it to the campground where the Pine Flycatcher had built it's nest and was continuing. The bird wasn't found until ten or fifteen minutes after arriving. We found what was probably the nest early on, and spread out to try and see the bird out foraging. Finally the bird was spotted at the base of the nearby hillside. We watched it for a bit before agreeing that is was indeed the flycatcher that we were looking for. We stood around watching it visit the nest and then fly off, then fly back over and over for close to an hour. At one point it flew in and landed on a branch just 5 feet away from me, I was able to get a good look at the bright yellow lower-mandible. What an amazing bird to see, and my second first ABA record bird. I got to see the Rufous-Necked Wood Rail in New Mexico a few years ago. After watching the bird come and go, a few of us walked back down the road a bit to try and see if an Aztec Thrush spotted a few days earlier was still around. It wasn't, but I did see a Sulphur-Bellied Flycather perched up in a tree, but flew off before I could get a shot off, my second lifer tick of the day. We loaded back up into our ride's truck and he took us back down to where we had parked. It was still fairly early, so I decided to do a bit more birding on my way back to the Phoenix area. 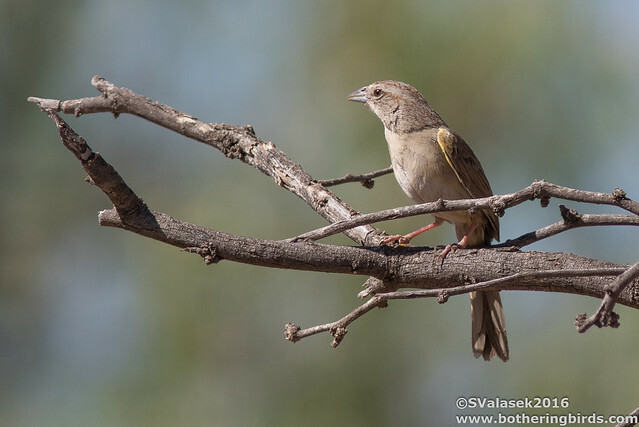 Just across the road from where I had parked I spotted some Botteri's Sparrows in some shrubs. There were some Cassin's Kingbirds flying around along with some House Finches and a Red-Tailed Hawk flew past. 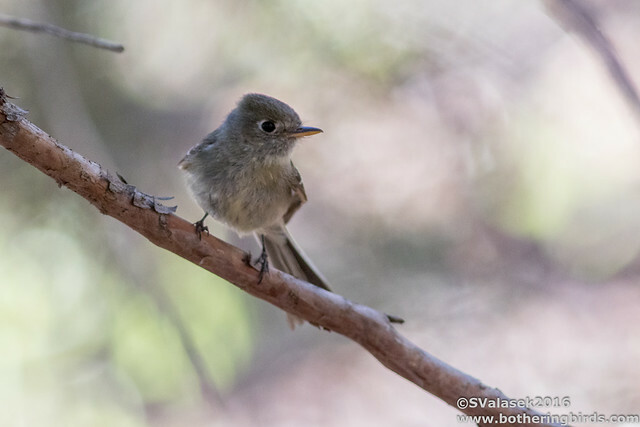 I had enough time to stop by Madera Canyon on my way, which was fairly close to the Pine Flycatcher spot on a map. 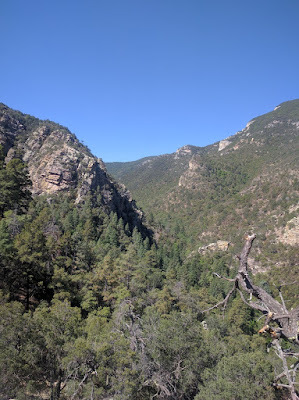 I took some back roads through Box Canyon where I saw some Eastern Meadolarks, a Swainson's Hawk and Turkey Vultures. Box Canyon and the grasslands leading to Madera Canyon wasn't very busy, so I drove right to the Santa Rita Lodge. There had been some rare hummingbirds reported recently, but nothing recently. 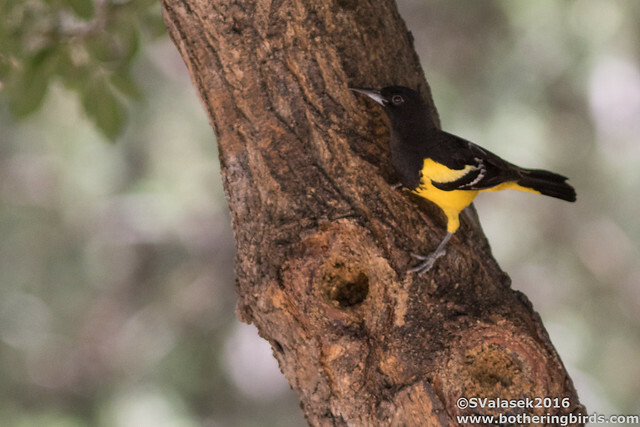 I did get to see a nice male Scott's Oriole visit the feeders. 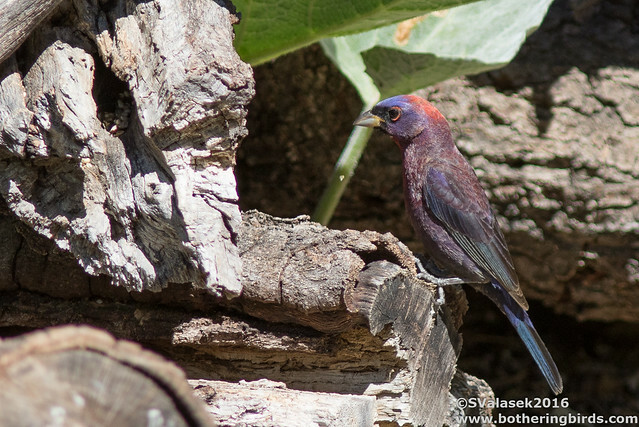 The other usual birds were about: Lesser Goldfinches, Brown-Headed Cowbirds, White-Winged and Mouring Doves, Black-Headed Grosbeaks, Great-Tailed Grackles, Acorn Woodpeckers, House Finches, Broad-Billed, Black-Headed and a few Magnificent Hummingbirds and Blue Grosbeaks were all busily feeding. But then I saw a small Woodpecker towards the back. 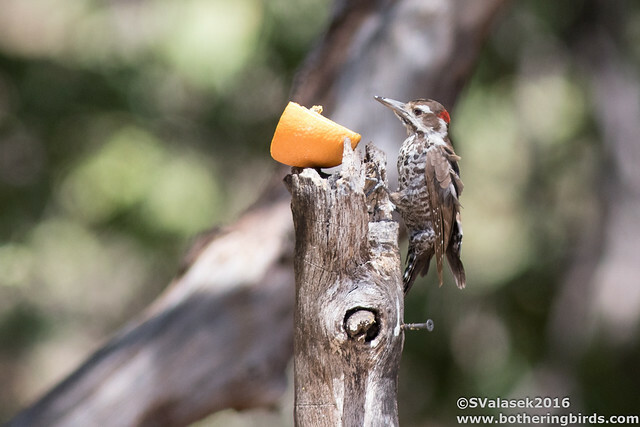 It was brown colored and could only be an Arizona Woodpecker! A surprise and a lifer for me. But that wasn't the only new bird for me. Some blue and red birds were foraging in dead trees below me. A fellow birder, a Frenchman visiting from Oregon, confirmed that they were Varied Buntings, at least 3 males where there. And I finally got some good shots of a Bridled Titmouse in good light. You are asked to only stay at the lodge feeders for 30 minutes, so I decided to head up canyon and see if I could find any Elegant Trogons, despite it being the wrong time of day for them. I've said before that these are my new nemesis birds and they continued by not making an appearance or a sound for me once again. 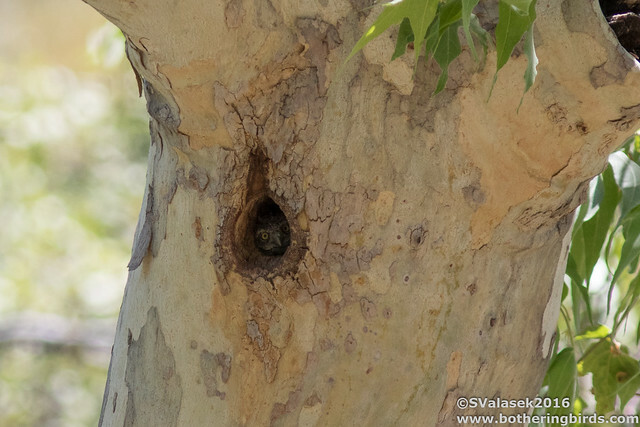 But I met a couple hiking who pointed out a Northern Pygmy Owl nest in a sycamore tree. I waited for a full 30 minutes for one of the adults to either leave or arrive, but they were being homebodies this day. I had to settle for a shot of one peeking out and somehow seeing me standing on the other side of the canyon. Northern Pygmy Owl - Upper Madera Canyon, Arizona. Just seeing the Pine Flycatcher was the highlight of my day, but I got to add some other lifers to my list and see some old favorites too. It was another great day in Arizona, a true birders paradise. Extras: Read more on the historical significance of the Pine Flycatcher here and here. The location of Aliso Springs can be found on eBird here. And once again, the lovely Santa Rita Lodge is one of the many great places to stop in Madera Canyon. In my last post, found here, I talked about the first part of my visit to the Southeastern corner of Arizona, centered around Sierra Vista. 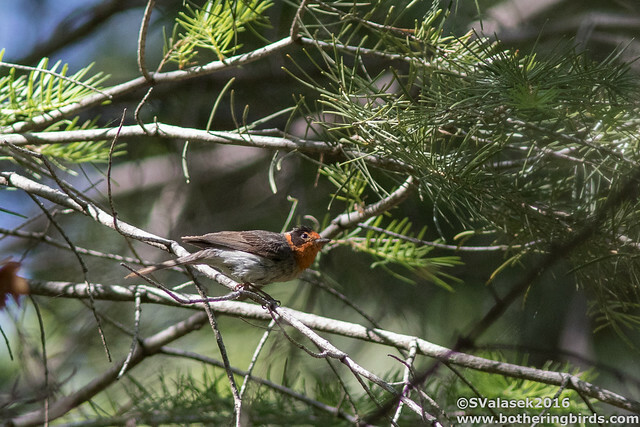 There were 2 rare birds that I wanted to twitch, Tufted Flycatcher and Slate-Throated Redstart. 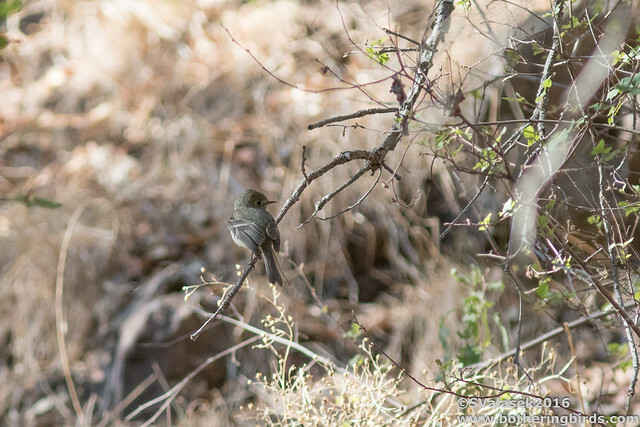 I got the Tufted Flycatcher the first day, and planned on driving East to the Chiricahuas and the Redstart, on the second. Or course there were other birds to see, and this part of the state is the Hummingbird Capital of the USA. 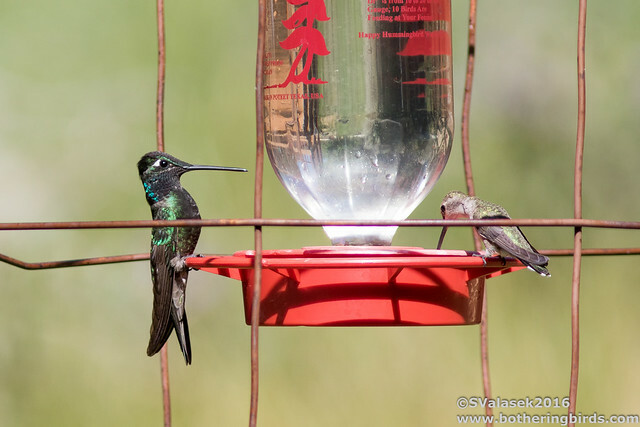 There are a few people in the area who host hummingbird feeders at their B&Bs or just their house. You can pay a nominal fee, $5 or sugar, to sit and watch for a bit. I stopped by the Beatty's Guest Ranch in lower Miller Canyon in Hereford. 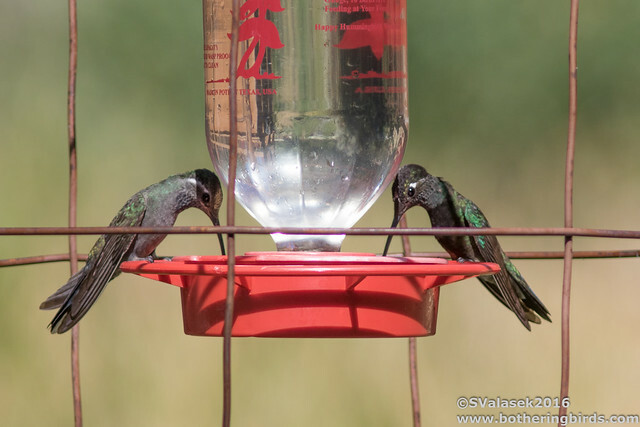 They have a few feeders with bleachers nearby and have been the home of some very rare hummingbirds in the past. 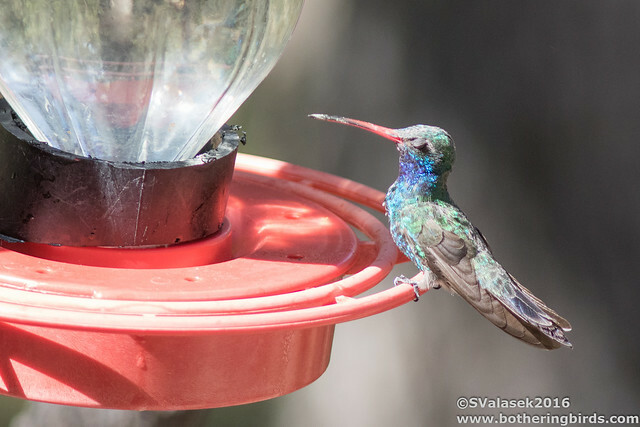 The day that I went they only had the usual suspects: Broad-Billed, Black-Chinned and Magnificent Hummingbirds. 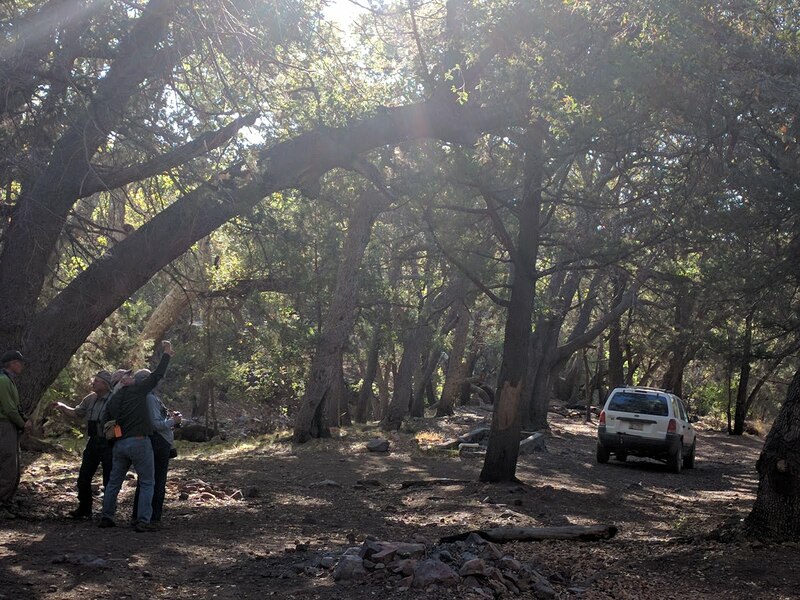 They also have Spotted Owls on their property, I was giving directions up the canyon to where they were seen the day before, but I spent an hour scanning every tree and never saw them. I'm thinking that I wasn't up far enough. 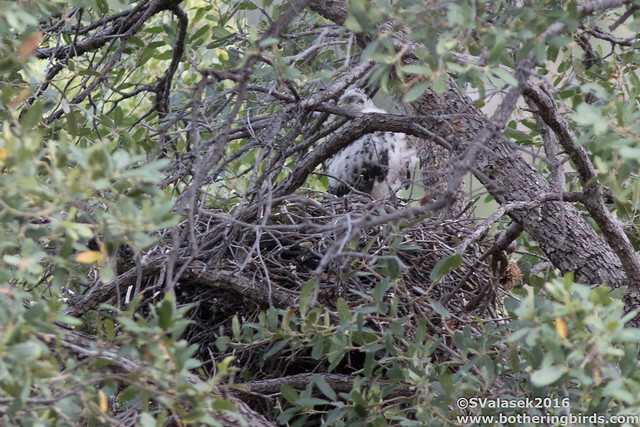 Instead I went below their property a bit and got to see a Northern Goshawk nest. I saw just the one chick, but it was hidden very well and there could have been another. I didn't want to get any closer because (I'm assuming) dad was watching out from a nearby tree. The Sun was setting and I had a bit of a drive ahead of me, so I hopped into the van and drove east towards Tombstone. I was surprised by the amount of wildlife on the road. I saw foxes, coyotes, javelinas, Lesser Nighthawks, mice and 4 rattlesnakes. I stopped to let one get across, these were the first wild rattlesnakes that I've seen. 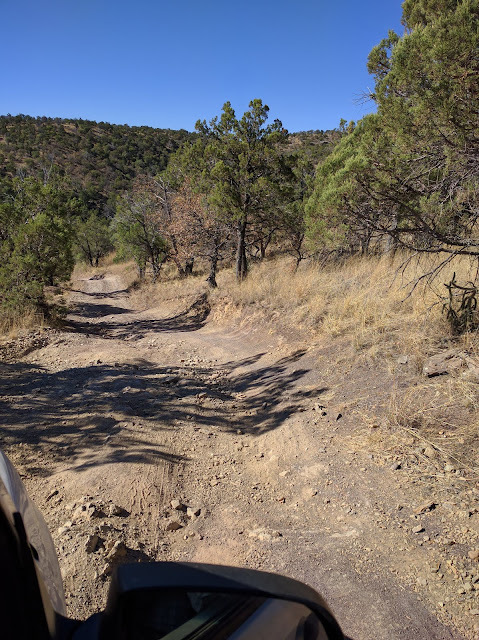 I finally made it into the Chiricahuas and drove over the worst washboard roads that I've ever been on. Fillings barely intact I drove by the Slate-Throated Redstart stake-out looking for a campground that was supposed to be just a mile or 2 away. I never found one and instead spent a restless night on a wide-part of the road. I wanted to be up before dawn since that's when the bird has been seen reliably, so the alarm came early. I had just short drive downhill to the location and I was there before 5am. It was already light and I sat waiting. There was supposedly a nest located beside the road and a hand "STRE" sign was scrawled on a rock. I sat there waiting and waiting but not much of anything was happening. I made my way next to a bush in order to get a better view to where I thought was the nest location when a bird appeared right next to me and starting screeching away. I got a glimpse of a plain, dark upper with a yellow belly. It looked like a juvenile Slate-Throated Redstart to me. I never managed a photo before it disappeared again. I stood around for another 90 minutes without another look. I walked back to my van for some breakfast and to wait for the Sun to make a proper appearance. I walked back down to the spot around 7:30am and it was much busier now. 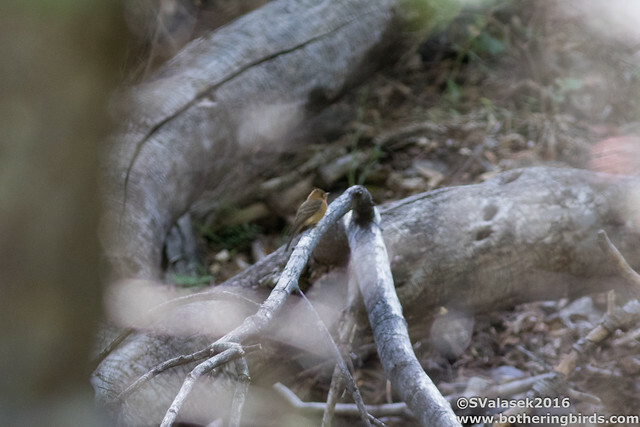 There were some Painted Redstarts, Hutton's Vireos, House Wrens and Yellow-Eyed Juncos flying and calling about. At this time a van pulled up, too close to the nest location in my opinion, and a tour group of birders from Florida exited. They spread out looking for the bird, and anything else around. Then, just a minute or 2 later, I saw the Slate-Throated Redstart fly off and up the hillside from the road. We waited patiently and a few moments later it came down into the trees on the inside of the horseshoe bend and jumped around inside of some pine trees. It never sat still long enough to get a really nice shot, but it did take the time to tell us what he really thinks about everyone bothering him. Supposedly there are 2 different STREs present, but nobody has had photos of 2 at the same time. I was satisfied with the looks that I had and the photos were good enough for a bird that can't stand still and sit outside of the shadows. Instead of turning towards home, I thought that I would head towards the Southwestern Research Station, which is run by the Smithsonian Museum of Natural History. They supposedly had some Blue-Throated Hummingbirds which I have wanted to see. And also the chance of seeing Elegant Trogons in the area. So I continued further into the mountains and further away from mobile phone signal and access to Google Maps (stupid me didn't have a paper one). When I got to the research station, which is in a beautiful location and was really busy with people. I found the hummingbird feeders which were also really busy. Most of the Hummingbirds were Magnificents and Black-Chinned, but a few Blue-Throated were there too. 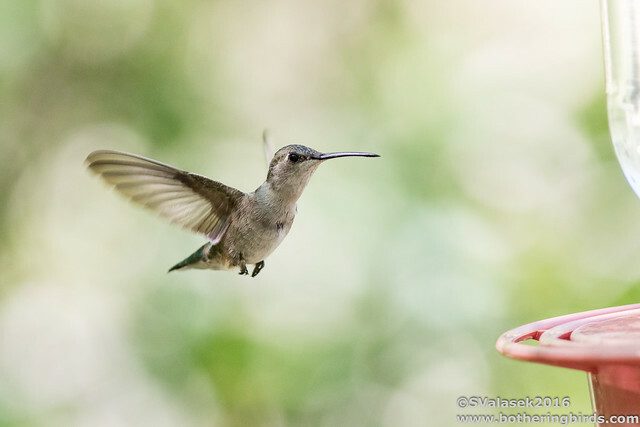 These are another large hummingbird, 2nd in size only to the Magnificent that are found in the USA. Here's a good size comparison, Magnificent on the left and Black-Chinned on the right. 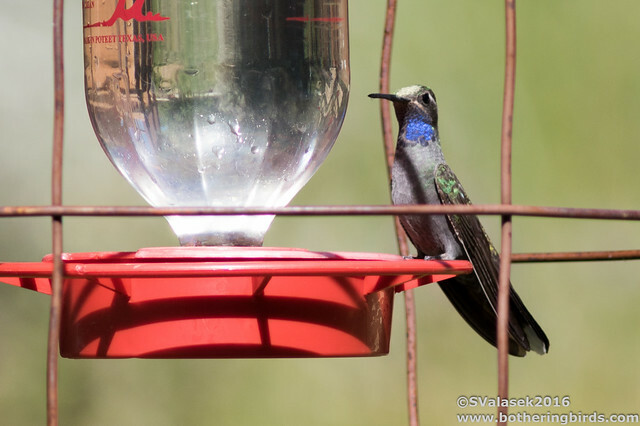 The Blue-Throated Hummingbird were great to see. They would fly in making "peep" sounds. 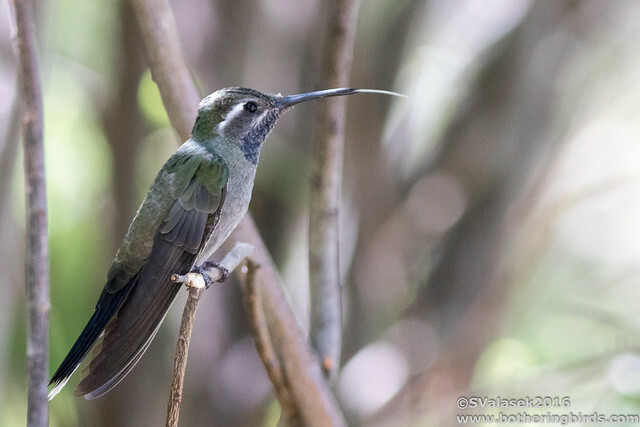 If you couldn't tell any other way, the BTHU have nice white eye-stripes or ears on the sides of their heads, but are much larger than a White-Eared Hummingbird would be. Not to focus and the larger ones, the Black-Chinned Hummingbirds are great to watch too. Since I was in the area I decided to visit the South Fork trail to try and see Elegant Trogon. One of the Florida birders that I met earlier said that they were there and saw 4 or 5, with one right from the carpark. Well, I made the drive and ended up not seeing or hearing any (seriously, the glove has been dropped Elegant Trogons!). But along the drive in I saw an American Redstart fly into the trees from the roadside, which gave me three Redstart species in one morning (Slate-Throated and Painted earlier)! 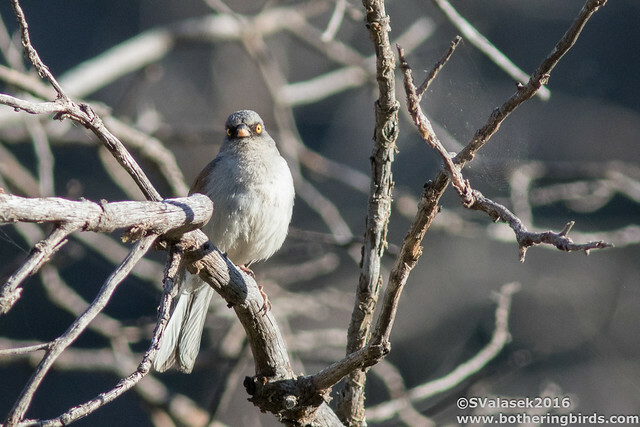 And on my hike up the South Fork trail, which is in the bottom of a lovely canyon, I added a lifer, Rufous-Crowned Sparrow. Still having no access to data, and thus a map, I drove further East into Portal Arizona. At this point I was really tired, and a bit birded out. So I stopped at a tiny diner/convenience store and had some lunch and got directions back to the Interstate. Which oddly enough took me into New Mexico for a stretch, my first visit back since moving away 2 years ago. It was a long drive back towards home, but a successful 2 days birding. I would end up seeing 62 species with 6 lifers seen, and 2 of those ABA code 5 birds. 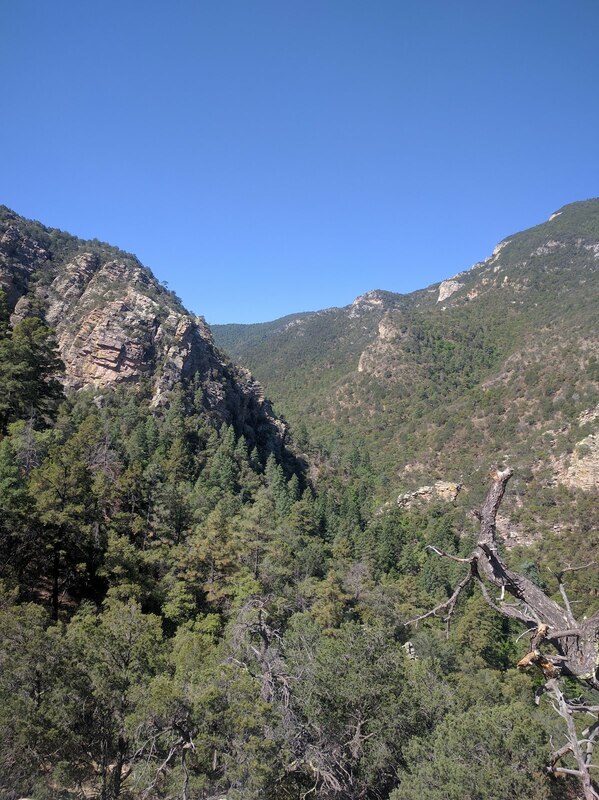 The Sierra Vista and Chiricahua areas are beautiful locations that I can't wait to visit again. Beatty's Guest Ranch ($5 to visit their hummingbird feeders and get directions to Spotted Owls). 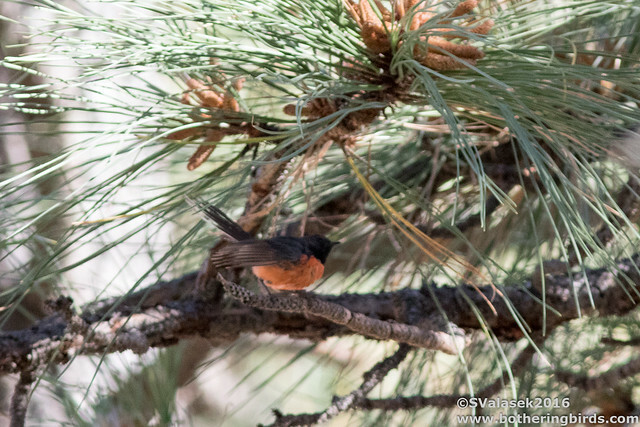 Stakeout for the Slate-Throated Redstart (which as of today, June 17th, is still present). Southwestern Research Station (cabins available in some parts of the year, worth the visit for sure). 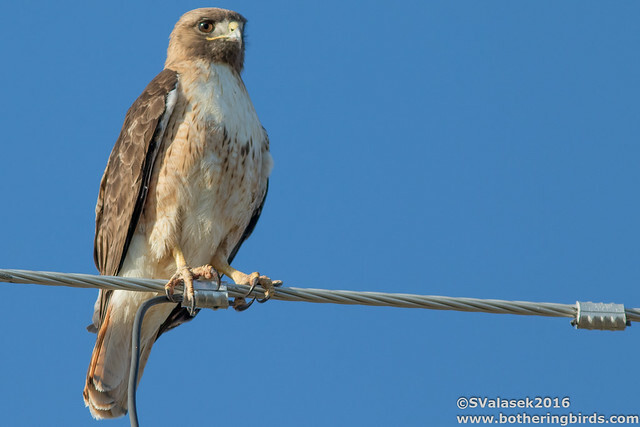 And here's a link to some information to birding around Portal Arizona. If you do plan on visiting the area, then I recommend finding a copy of the very handy book: Finding Birds in Southeast Arizona sold by the Tucson Audubon Society. As always, thanks for making it this far. And I'd like to wish a happy 4th birthday to my son Benny!!! Arizona is no stranger to rare visitors from Mexico. 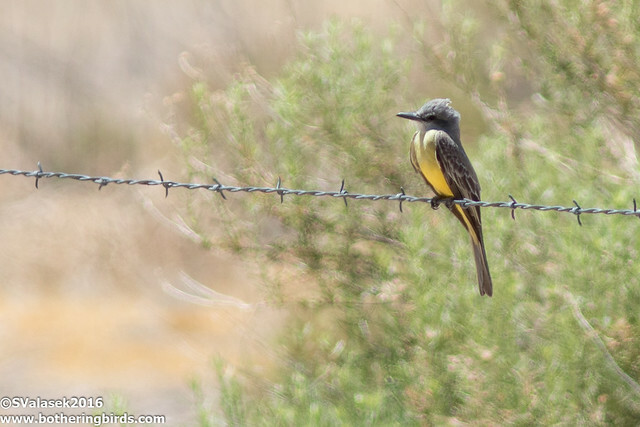 I had the chance to drive down and see two of those in early June, Tufted Flycatchers in Ramsey Canyon and Slate-Throated Redstart in the Chiricuhuas. I drove down in time to watch Game 2 of the Stanley Cup Finals and see my Penguins take an exciting win. After the game I drove up into Carr Canyon and camped the night at a nice little campground called Reef Townsite. I was up early so that I could get over to the Ramsey Canyon Preserve one canyon north. But first I had to take in the beautiful view of Sierra Vista and the rising Sun. I made my way down and the short drive to Ramsey Canyon road. Unfortunately the gate was closed at 6am and weren't to open until 8am. So I either missed out on 2 hours of birding Carr Canyon, or 2 hours of extra sleep. I drove back into town and grabbed some coffee and breakfast before returning. 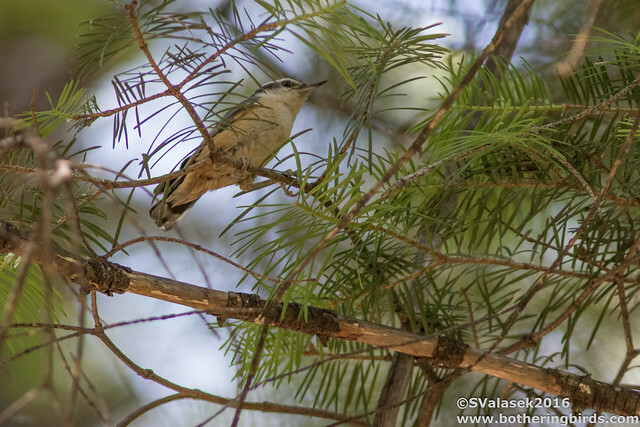 I took my time driving up Ramsey Canyon and was treated to some nice birds along the way. A Red-Tailed Hawk let me get a good photo through my sunroof. 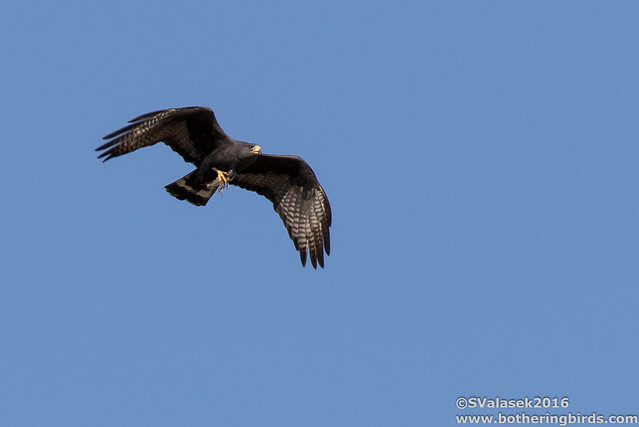 After short bit of driving what I thought was a Turkey Vulture flew low over the road, but after a quick double-check it turned into a Zone-Tailed Hawk! I pulled off of the road and jumped out and managed a few great shots as it circled low overhead with breakfast in claw. But before I went much further, I saw a pack? herd? 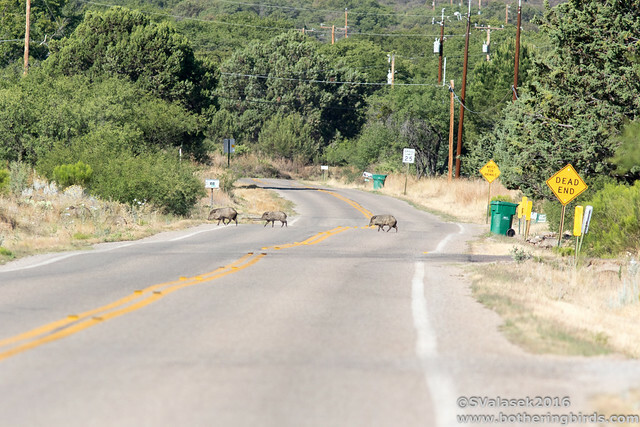 of Javelinas crossing the road, my first time seeing them in the wild. I arrived back at the gate to Ramsey Canyon Preserve, which was still closed, and a queue formed behind me waiting for 8 o'clock. 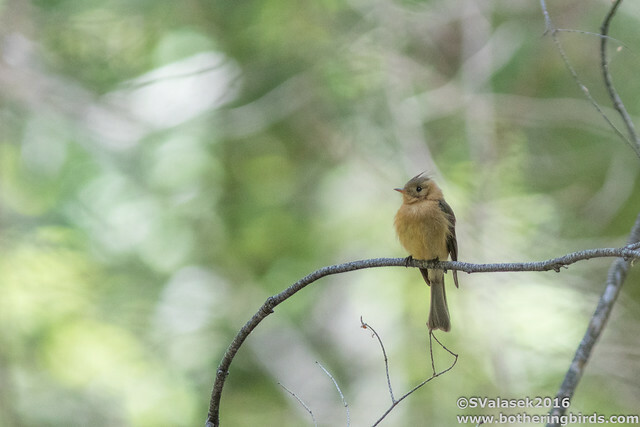 I paid my fee and began my hike up into the canyon to the Tufted Flycatcher nest-site, but first took my time seeing if a Flame-Colored Tanager was still around (it wasn't). The trail climbed 500 feet via a series of stairs and switch-backs, but I was rewarded with a nice view of the canyon from the top. After a break at the overlook, I joined the Hamburg Trail which continued down a gentle hundred feet in elevation to join a small stream. But before it reached the bottom it began to get a bit birdy and I was rewarded with my first lifers of the day, Red-Faced Warblers. 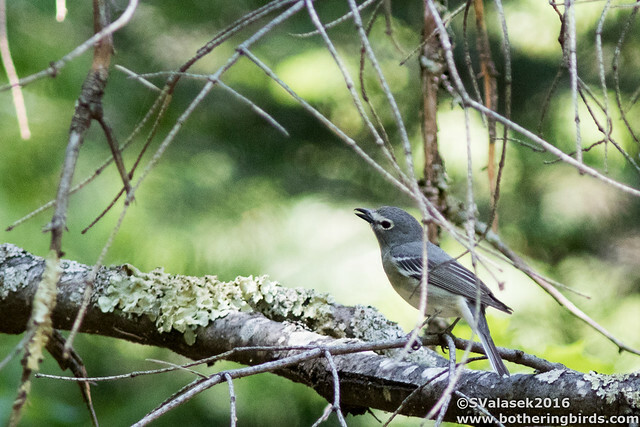 A Plumbeous Vireo was also present, these birds are usually up in the tree-tops, so it was nice to get an okay shot of one singing. At this point the trail followed a lovely stream under some trees, it finally cooled off a bit many butterflies were using the stream. 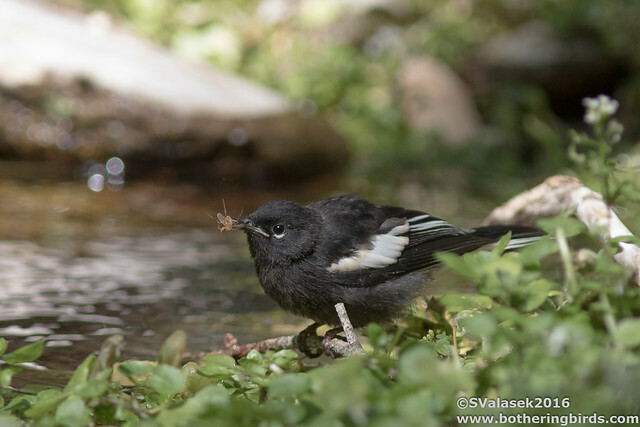 At one of the stream crossings I stopped to watch an immature Painted Redstart hunting along the water's edge. 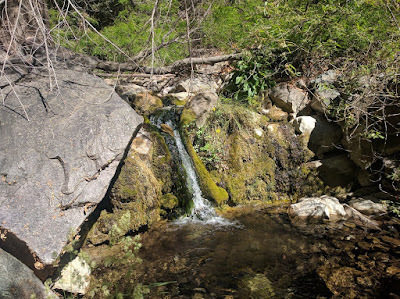 I made my way a bit further up-stream, counting the times that the trail crossed the water so that I knew where the Tufted Flycatcher area was. I finally found it marked with a cairn of stacked rocks, and also some other birders already there. Just as I arrived they were looking and pointing a bit off of the trail, sure enough, there it was. It was the male out catching food to take back to it's mate on their nest hidden up the slope. It was working hard and we got loads of good looks at it. The hike up really paid off seeing this great bird. I'm hoping that the nest works and that they make a new home in Arizona. I spent nearly an hour watching the bird, and trying to hear Elegant Trogons (to no avail) and decided to head back down. 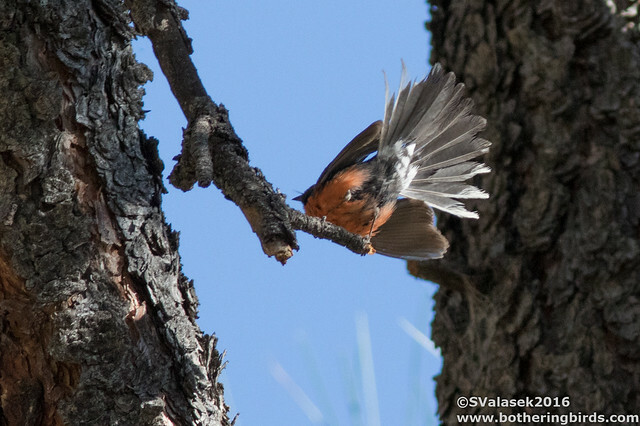 Just a bit further downstream I was lucky to catch some good looks at a new family of Red-Breasted Nuthatches, my first in Arizona. 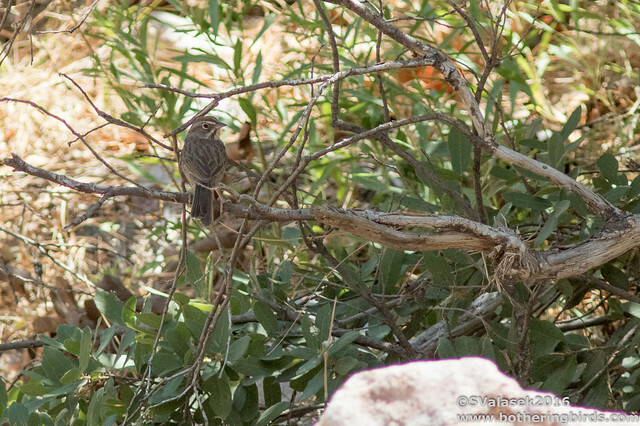 It wasn't just birds, the upper canyon had many butterflies, lizards and even deer. 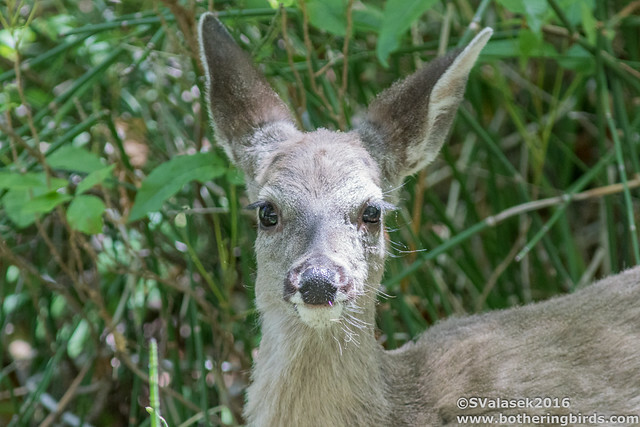 The Sky Islands of Arizona are home to a small type of White-Tailed Deer called Coues Deer. There were a few pairs of mothers and last year's offspring. These deer don't have young until Summer, so it was easy to age the smaller ones. What a great trip. 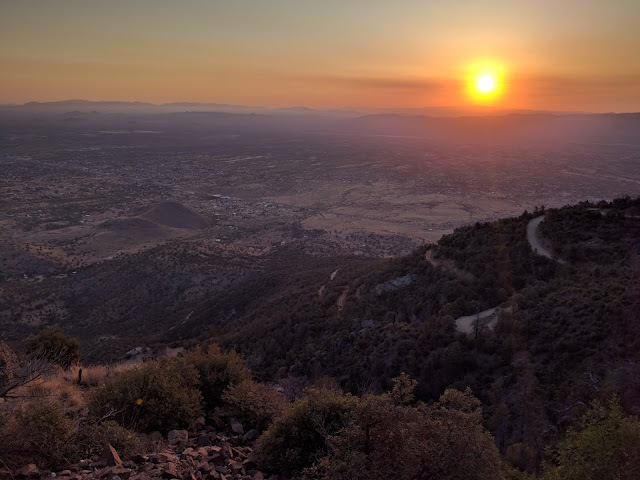 I don't always get to twitch, and I've always wanted to see Sierra Vista and the Huachuca Mountains. But I wasn't done yet. My next post will have be part 2 of my trip, loads of Hummingbirds and another rare bird. Sierra Vista is 2-3 hours from Phoenix off of I-10. It is home to an Army post and has many hotels and restaurants. It's not hard at all to drive from the town into any of the canyons for birding. This could be a cheaper alternative to one of the wonderful Birding B&Bs in the surrounding canyons. 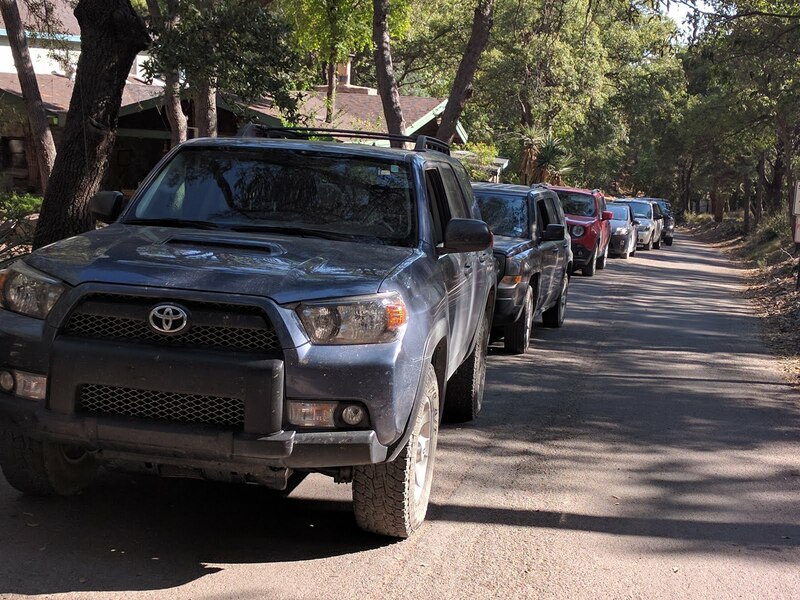 I camped at the Reef Townsite campground up Carr Canyon. It's up a primitive dirt road with many switchbacks, but nothing that my Honda Odyssey couldn't take going slow. There were toilets up there, but no other services. You'll need to take all of the water that you plan on using. The campsites were nice, there were grated and flat spaces for tents and pull-through spots for RVs, although campers longer than 12 feet may not make it past the switchbacks. It's just $10 a night via honor system, bring a pen for the form. Ramsey Canyon Preserve is located at the end of Ramsey Canyon Road, just off of Route 92 south of Sierra Vista. Be forewarned that the gate is securely closed until 8am. And the entire preserve is closed on Tuesdays and Wednesdays, so plan accordingly. There is a cute little gift shop and restrooms at the visitor's center. There are many hummingbird feeders and some activities for kids in the lower part of the preserve. 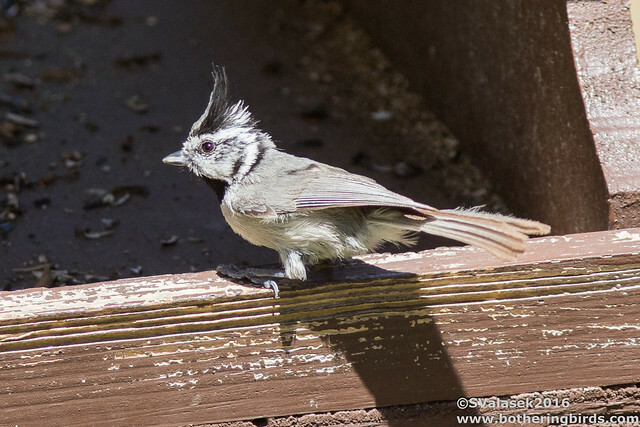 They have a guided bird walk on Thursdays Also be sure to scan the feeders at the adjoining Ramsey Canyon Inn just before the gate. I saw Painted Redstarts and 3 or 4 types of hummingbirds there. A few weeks ago I had the chance to twitch some rare birds. 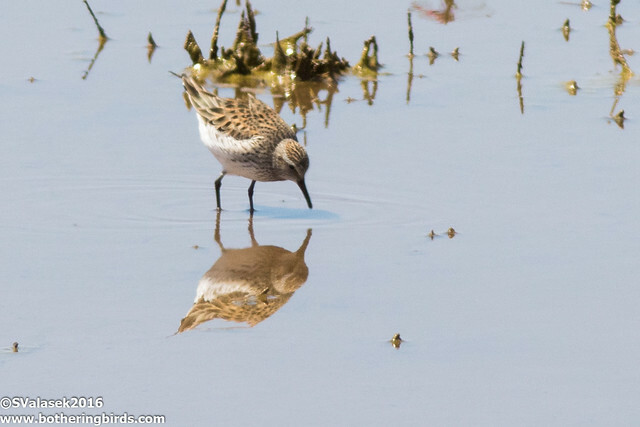 Three White-Rumped Sandpipers were found in a tiny pond in the Santa Cruz flats, an agricultural area in Pinal County, located between Phoenix and Tucson. I found the pond, basically a giant puddle in a horse pasture next to a house. 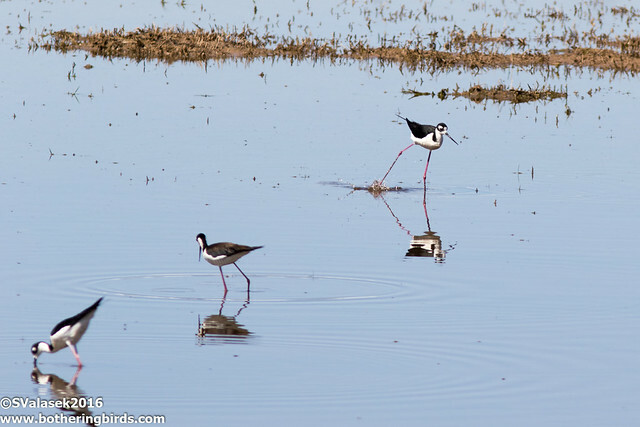 First I noticed some Black-Necked Stilts wading around. It took me a few moments scanning with the scope to find the small waders that were there. The listserv mentioned 3 of them, but they were spread out. 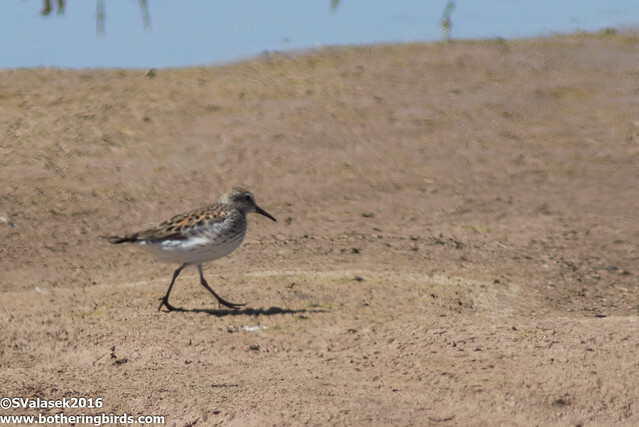 Eventually I found all 3 of the White-Rumped Sandpiper, which is a rare visitor to Arizona. From what I can tell with Ebird data, they've only been found in the state twice before. And as an extra treat, a pair of Mexican Mallards dropped in, the first time I have seen this subspecies. 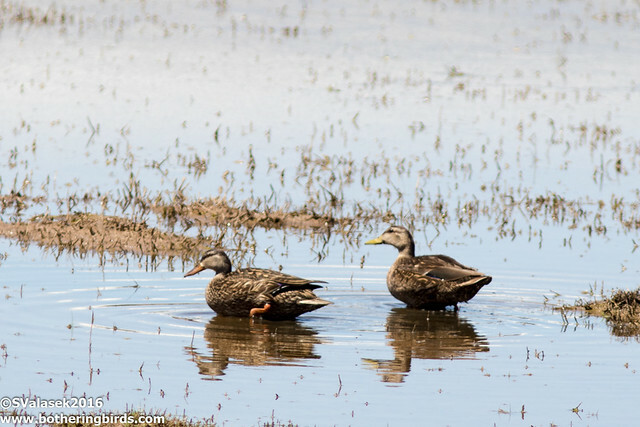 The male really resembles the female of "normal" mallards. I can't remember the last time that I was excited to see one of these. As I was watching the birds, another birder stopped by. He said that he was doing "sort of a Big Year" and was glad to tick the White-Rumped Sandpipers on the West Coast. He asked me if I knew where Tropical Kingbirds were nesting and I said no. But a quick check on Birdseye gave some reports from just a few miles away. I hesitated on joining him, but then he mentioned seeing Crested Caracaras there a few years ago and I had to go. As I was driving down I saw some Turkey Vultures soaring north of me, and then another bird flew to join them. I saw some white on the wings and I thought that maybe it was a Black Vulture. I stopped the car and jumped out and managed a quick look before it flew off. 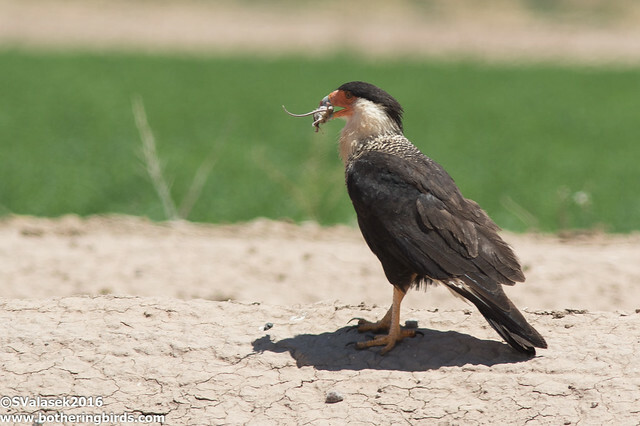 It wasn't a vulture at all, but the largest member of the Falcon family, a Crested Caracara! 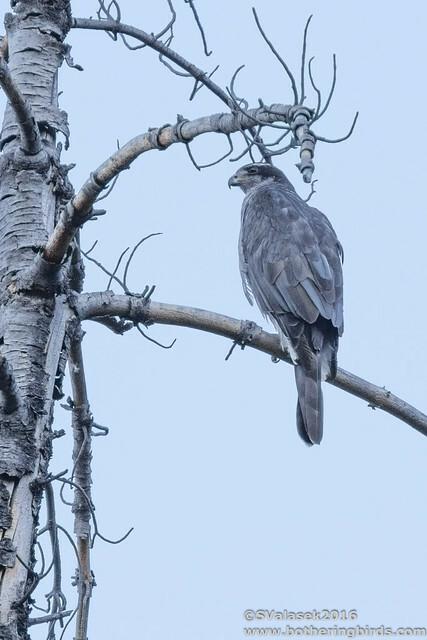 Finally a bird that I've been dying to see since I started birding and had dipped on the last 2 visits to this same area. 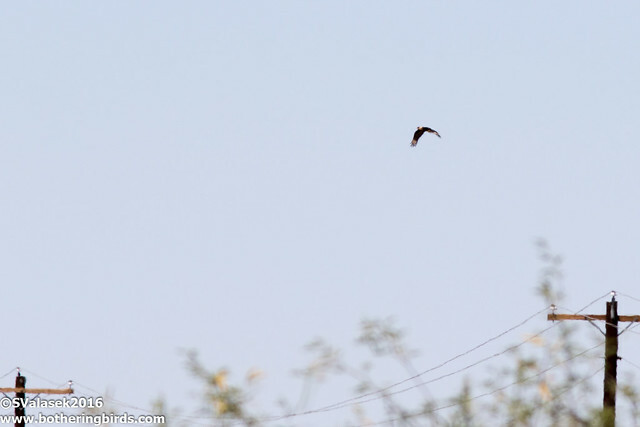 I was so excited as it flew off and I kept on to the Kingbird area. The first Kingbirds that I saw had white edges on the tail, which told me that they were Western Kingbirds and not Tropicals. But just a further walk down the road were Kingbirds with a higher pitched call and no white edges on their tails, Tropical Kingbirds. 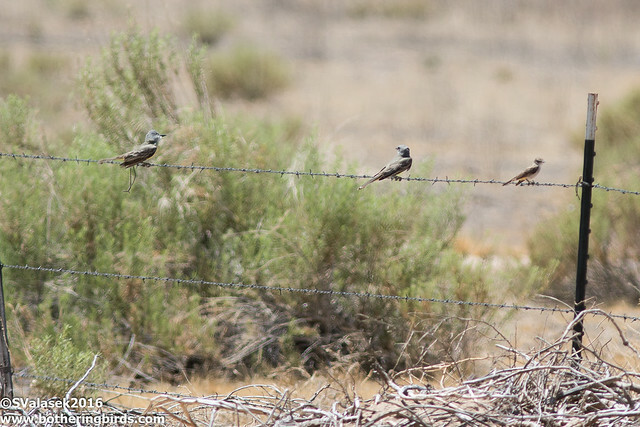 Apparently they nest in a row of Cottonwoods on the Southern edge of Picacho Highway. As you can see, the bill is a bit my sturdy too. There were quite a few flying around, I recorded 3 as the high count, but there could easily be more. I said thanks and good luck to the guy doing his Big Year and turned back for home. 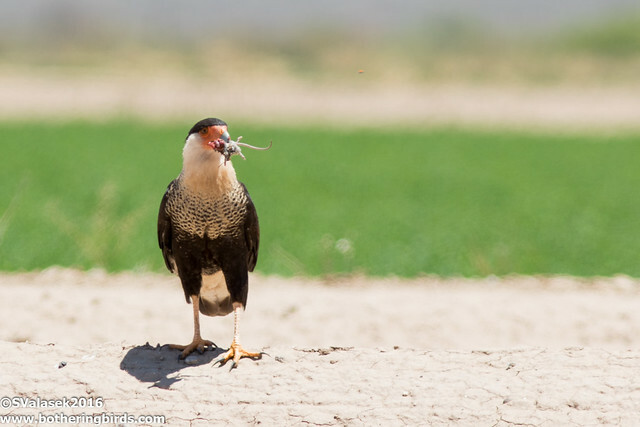 I had just enough time to drive north to where I saw the Crested Caracara fly off to in hopes of getting a better view. But low and behold, what did I see sitting just off of the road but one of the bloody birds. I was so excited. I put down the passenger side window and crept up beside it. Wow, I couldn't believe it. It had most of a mouse in it's beak, so maybe there was a nest nearby. I was able to get a few shots off before it flew off. Three great lifers in one morning made for a great spontaneous day of birding. It's days like these that are the rewards for all of the time, money and effort that goes into this "simple" hobby. 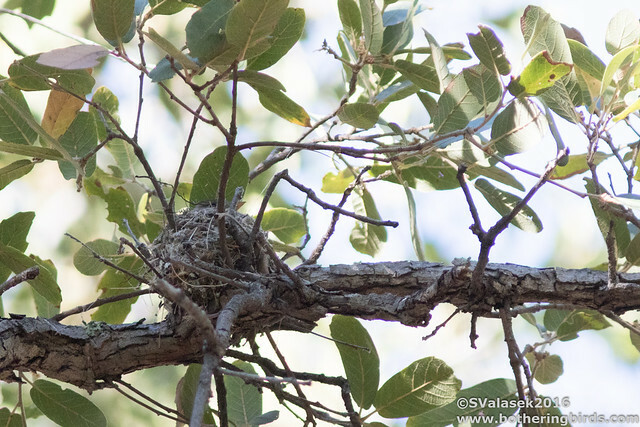 You can check out my eBird post here, which will give you the location of the Tropical Kingbirds and potentially a Crested Caracara, along with the normal birds of the area. Unfortunately, the horse pond has dried up and the White-Rumped Sandpipers have moved on. You can follow me on Instagram for more recent bird photos (I'm a few weeks behind on posts and have some mega-rarities to talk about), and also some photos of Lego and my kids.